Madonna is an American recording artist, actress and entrepreneur. Born in Bay City, Michigan, she moved to New York City in 1977 to pursue a career in modern dance. After performing in the music groups Breakfast Club and Emmy, she released her debut album in 1983. She followed it with a series of albums in which she found immense popularity by pushing the boundaries of lyrical content in mainstream popular music and imagery in her music videos, which became a fixture on MTV. Throughout her career, many of her songs have hit number one on the record charts, including “Like a Virgin”, “Papa Don’t Preach”, “Like a Prayer”, “Vogue”, “Frozen”, “Music”, “Hung Up”, and “4 Minutes”. Critics have praised Madonna for her diverse musical productions while at the same time serving as a lightning rod for religious controversy. Her career was further enhanced by film appearances that began in 1979, despite mixed commentary. She won critical acclaim and a Golden Globe Award for Best Actress in Motion Picture Musical or Comedy for her role in Evita (1996), but has received harsh feedback for other film roles. Madonna’s other ventures include being a fashion designer, children’s book author, film director and producer. She has been acclaimed as a businesswoman, and in 2007, she signed an unprecedented US $120 million contract with Live Nation. Madonna has sold more than 300 million records worldwide and is recognized as the world’s top-selling female recording artist of all time by the Guinness World Records. According to the Recording Industry Association of America (RIAA), she is the best-selling female rock artist of the 20th century and the second top-selling female artist in the United States, behind Barbra Streisand, with 64 million certified albums. In 2008, Billboard magazine ranked Madonna at number two, behind only The Beatles, on the Billboard Hot 100 All-Time Top Artists, making her the most successful solo artist in the history of the Billboard chart. She was also inducted into the Rock and Roll Hall of Fame in the same year. Considered to be one of the “25 Most Powerful Women of the Past Century” by Time for being an influential figure in contemporary music, Madonna is known for continuously reinventing both her music and image, and for retaining a standard of autonomy within the recording industry. Madonna has always been known for her ability to reinvent herself, but maybe the reinvention of her face has past it’s expiration date. From the above picture taken from early in her career, and the after taken as recently as December 2011, Madonna is looking pretty freaking good for a 53 year old Mom of 4… that is if you don’t ask her to turn her head or smile! 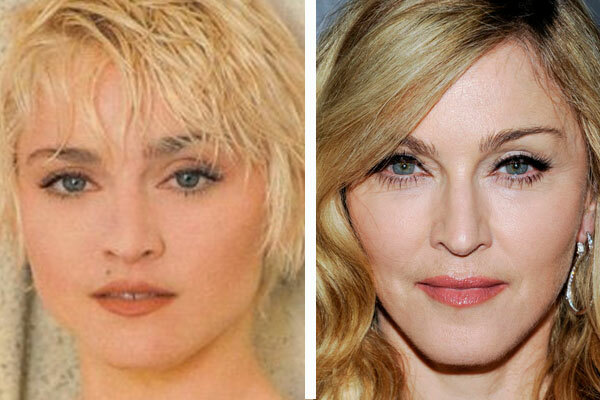 The after picture featured below is Madonna just a couple of months before her facial fillers had had time to settle. Granted, in the before picture she is not smiling but in the after shot it looks as though her cheeks are about to burst! 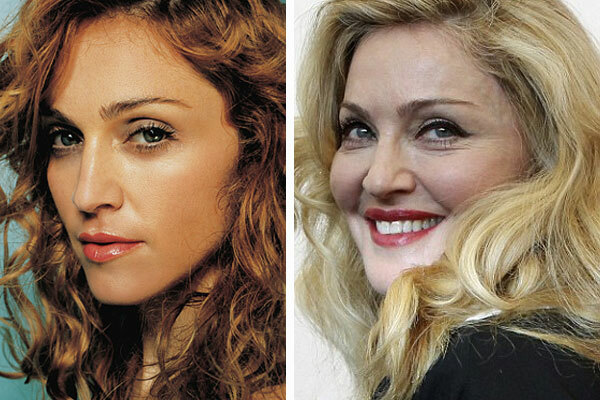 Madonna has all the money in the world to pay the best Plastic Surgeons to nip and tuck her to look as beautiful as possible, but sometimes you need to know when to say when. Madonna is known for keeping her look fresh, but in these before and after pics she looks like she has gone past her expiration date! In the pictures it looks like the photoshop artist altered her skin color, under eye bags, wrinkles, eye color, nose, and clavicle bone. It is truly amazing the changes that can be made to alter ones appearance these days. So remember, looks can be deceiving, almost 99.9% of all pictures you see in magazines, posters, and CD covers have been dramatically altered.